Floralife will ship your product via the best method available. Our shipping methods currently included USPS and Fedex. Q. Why are my shipping charges so much? a. Floralife currently sends via ground delivery rates to keep your charges lower. Our shipping rates are determined by the weight of your package(s). Q. How long will it take to get my shipment? a. Floralife strives to ship your package as soon as possible. It will usually take us 3 to 5 business days to pull your items and process your package. 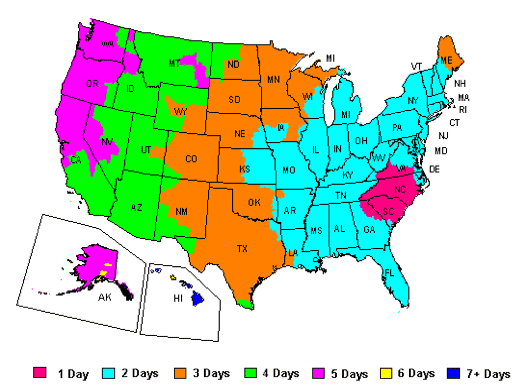 When your package ships, your city/state falls into the following shipping zones. The following map shows your package(s) estimated travel days. Please keep in mind that actual deliveries may depend on volume, weather and delivery location, such as residential areas. We want you to enjoy what you ordered, but if something is not correct, let us know. Our top priority is to provided the best possible service. If for any reason you are not satisfied with your purchase, you may return the unopened item for a refund. Returns must included a receipt and items must be in the original condition, including tags and labels. One we receive the returned merchandise, we will credit your account within 10 business days. Shipping charges are not included in the refunded price. We will be glad to replace any damaged or defective products, please contact us if there is any damage to your package. We may ask you to return the package and its contents to verify shipping claims.